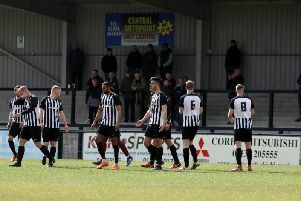 Corby Town produced a stirring fightback to keep themselves right in the hunt for the Evo-Stik League South Division One Central title as they claimed a 5-2 success at Welwyn Garden City. The Steelmen found themselves 2-0 down after just 20 minutes but a goal from top scorer Elliot Sandy three minutes before half-time proved to be the spark for an incredible second half as Steve Kinniburgh’s team ran in four goals to secure a third win in a row. The victory helped Corby close the gap on second-placed Peterborough Sports to just two points and they are also now within four of leaders Bromsgrove Sporting with two games in hand. And it now sets things up perfectly for a huge showdown with Sports at Steel Park on Saturday. Things started badly with Elliot Bailey giving the hosts the lead after he scored from the rebound after Dan George had saved a shot. And Corby looked to be in a bit of trouble when Bailey made it 2-0 with a header from a free-kick. Bradley Fortnam-Tomlinson forced the home goalkeeper into a save before Sandy got the final touch after a goalmouth scramble gave Corby a lifeline before half-time. It took them just three minutes to get back on level terms when Fortnam-Tomlinson’s cross found the net to give him his first goal for the club. And the Steelmen didn’t look back from there. Sandy and Gary Mulligan both saw efforts cleared off the line but Corby went in front for the first time on 66 minutes when Fotnam-Tomlinson’s shot was blocked and Steve Diggin was on hand score his second goal in as many matches following his return to the club. Top scorer Sandy made it 4-2 when he nodded home after another header had come off the crossbar. And just two minutes like it was five when Joel Carta turned on the edge of the are and fired into the bottom corner. Carta sent another effort over the bar but there were no further goals as Corby wrapped up another three points.